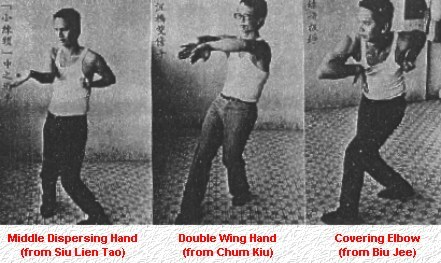 The Wing Chun system began with Ng Mui Si Tai who taught it to Yim Wing-Chun. Yim taught her husband, Leung Bok-Tao. In Foshan, Leung took a student named Wong Wah-Bo who was a member of the Red Junk Opera. Another Red Junk student, Painted Face Kam, taught Wing Chun Kuen to Fok Bo-Chuen and Fung Siu-Ching. They passed the art on to Yuen Kay-San. Yuen's nickname was Yuen Lo Jia (Yuen The Fifth) because, in his family, he was the 5th brother and in Guangdonhua, Jia signifies the 5th. Yuen Kay-San taught the art to a student named Sum who in turn taught Leung Dai-Chiu. In Yuen Kay-San Wing Chun Kuen, there is also a Juk Jong (Bamboo Dummy) that has twelve bamboo hands. 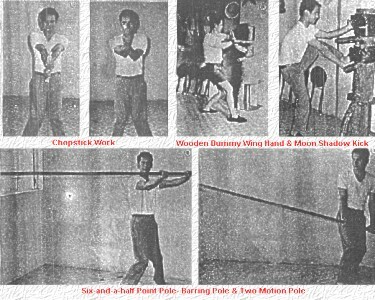 The Juk Jong methods are all free-style, using the only the methods of Wing Chun Kuen as guidelines. The Juk Jong was used many years ago on the Red Junks. They would put bamboo arms through the cabins that had weights on the back ends. In use, they functioned like the Lien Wan Sa Bao (Linked Chain Sand Bags - a group of sand bags hung together). If a student is slow, they will be hit by the return of a previously struck arm (or sand bag). Leung Dai-Chiu sifu explained that Yuen Kay-San Wing Chun Kuen uses the Yee Jee Kim Yeung Ma ("Yee" Shaped Groin Clamping Horse). In this, the horse clamps, the chest is hollowed, the stomach relaxed in, and the shoulders dropped. When a hand goes out, the elbow protects the chest. Each elbow can be used like half a hand, so that together, a student can employ three hands at once. The wrist is very important in the transmission of power. The gall bladder is important as the source of courage. These two allow Yuen Kay-San Wing Chun Kuen to use an opponent's own strength against him with both soft and hard. Yuen Kay-San Wing Chun Kuen uses the Luk Dim Boon Gwun (Six-and-a-Half Point Pole). It is 7'2" in Chinese measurements. The knife method is Yee Jee Kim Yeung Dit Ming Seung Do (Parallel Shaped Groing Clamping Life-Taking Double Knives). In addition, Leung Dai-Chiu worked hard and so his teacher gave him knowledge for the treatment of falling, hitting, cuts, long-term blood stagnation, chronic pains, long-term wind damp, follow up treatment, children's lack of feeling in the extremities, rare problems, half body paralysis. This included both compresses and internal medicine, cleaning, operation, massage, and therapeutic massage.